Hemp jewelry is a revived trend from the 60's hippie culture. It's a relic from that era that has evolved to fit with today's fashion trends, with both the young and not-so-young wearing it all the time. Many enjoy the look and feel of the various jewelry pieces while others appreciate the natural materials used to create them and some love the challenge of creating their own unique accessories. Whatever reason you have, the internet is the place to find them, buy them or create them. Hemp Twine is the most popular material used to create jewelry and they are usually constructed using many techniques from macram, crochet, braiding, weaving adn beading. Hemp is made from 100% natural earth friendly fiber, it is durable and hypo-allergenic and fully biofegradalbe. Hemp is also softer and contains more natural oils than other fibers, creating a more flexible and resilient twine. 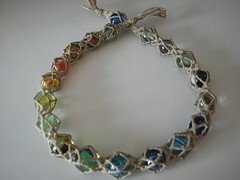 You can find various forms of hemp jewelry on the market today which includes but not limited to hemp bracelets and hemp necklaces. The unadorned pieces are usually more popular with the guys while the girls will sport the beaded versions.